Sorry for the late post, but it's my last week at my old job and I've actually-and sadly-been busy at work. 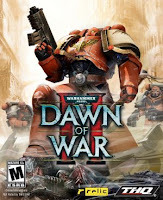 So over Easter Weekend I spent as much time as I could cracking out on Dawn of War II. The game has it's power klaw in me, and it's not letting go. When the game starts it's pretty straightforward. Kill the Orks, complete the missions, get the gear. But as the game progresses other planets open up. You start on Calderis, home world of the Blood Ravens, and move on to Typhon. Typhon is cool because you find yourself jumping back and forth from there to Calderis as missions require. But then Meridian opens up, and so does the game. Suddenly I have numerous missions on each planet. I have to decide which missions to complete. As I complete them, other missions open up. At the same time, there is a log that shows different actions that have occurred, and how they affect you. Some are directly related to your missions or abilities, some happen on planets you aren't currently at. Combine that with little counters that show the level of Tyranid infestation, and man the game is becoming a pressure cooker...and I love it. I love the detail, I love the customization of units, I love the consternation of not knowing exactly what units or what equipment to bring. Oh sure, intel helps and gives a clue, but if you use your resources wrong you will be replaying that mission, and days will go by. Which I have done. My buddy Steve and I have also been playing co-op. We are farther behind than I am in my single player campaign (as to be expected), but the game is completely different in Co-op. It's a more focused attack by us. In single player it's a mad cacophony of actions required for the units. You have different gear to use, you have to be aware of where your units are. You have to keep them all moving. In Co-op you have two units you are responsible for. This has allowed me to really utilize the equipment I have, and to focus on using those units to their max. I'm able to do a better job keeping my guys out of grenade range. It's a different way to play the game than single player, and it's pretty damn cool that way. My only gripe with co-op so far is communication. For some ungodly reason, my buddy can hear me through my mic, but I can't hear him. He's hosting the game because his computer kicks mine in the balls and calls it a little girl (and mine is no slouch), but he can't communicate to me. Combine that with the complete lack of documentation and any semblance of an in-game help for these matters and I really find that to be an annoyance that we shouldn't have to deal with in this day of multi player gaming. We're switching to Vent, but then how do I make sure he doesn't hear me through Vent and the game? Don't know, because the game doesn't tell you anything about co-op or multi player communication. We work with computers, veterans of many games, and we can't figure this out? That is messed up. Besides that one gripe, I love this game. I really do. I really really love it. I will continue to regale with updates as I play through the campaign in single player and co-op, but if you haven't gotten the game yet...get it. For the love of the Emperor and his Golden Throne...get it. The power of Gork and Mork compels you...get it.